The term modern kilts is used quite a lot these days. So which garment does this term refer to, and is it the same garment as the traditional kilt? Well to answer that question we have to go back at least to the end of the sixteenth century. It was around this time that the great kilt was first seen in the Highlands of Scotland. As wool became increasingly available, so did the use of the great kilt. But it was a cumbersome item of clothing (one reason that it was often discarded by clansmen before going into battle) and was not tailored, as we know our kilts today. The modern version made their appearance in the late seventeenth, early eighteenth century. They were tailored with the pleats sewn in, the first evidence of this is a kilt dating from 1692, which is in the possession of the Scottish Tartans Society. Some people say that the kilt as we know it today, is the great kilt with the upper half removed. This of course is not strictly correct, as I said earlier the great kilt was not tailored in any way. Most kilts these days are made from eight yards of material on average, depending on the size of the person it is being made for. The sett or pattern of the tartan also plays a large part in determining the amount of cloth that goes into the making of a kilt. 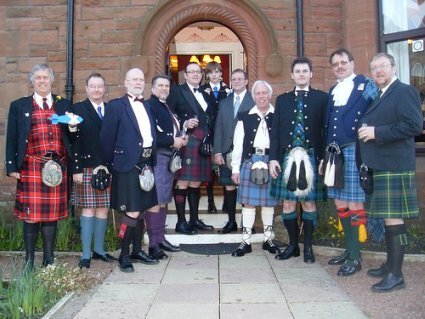 Below you can see a group of modern kilts, displaying a variety of different tartans. The photographer Alex Cunningham, whose photos are used a lot throughout this website, is standing on the far left of the photo. Whether the kilt is pleated to the sett or pleated to the stripe (this is where a line of the tartan is centered down each pleat) will also help determine the amount of material being used in the making of your kilt. A tartan which has a large repeat will have deep pleats, whereas a tartan with a small repeat will require smaller pleats. This is why an "eight yard kilt" may in fact actually end up using between six and nine yards of material. But that was not always the case, in fact for most of the nineteenth century kilts were being made from four yards of material, and it was not until around the end of that century that kilt makers began using the now standard eight yards. The pleating which was used on these four yard kilts was box pleating, which these days is normally used for military kilts, whereas today's kilts are mostly made with knife pleats. So you see a lot of people if not most, think that the modern kilt is the four yard kilt, often marketed as a casual kilt, and that the eight yard kilt is the traditional kilt of the Highlands. In fact the opposite is true, the four yard kilt was being worn for at least a hundred years before kilt makers began using the now familiar eight yards. So if you are thinking about having a kilt made, you may want to give a bit of consideration to just how much material you want your kilt to have.